We got Bluey in November 2004 around the time of my son Cameron’s 8th birthday when we thought that a new puppy would be a lovely surprise. Bluey was not a rescue dog from a pound or shelter. We got little Bluey as an 8 week old puppy from an old bloke who rescued unwanted Kelpie pups. When we went to choose a puppy there were lots to choose from, all ages from many different litters. All the puppies were so excited, jumping around everywhere, while this one little pup was just sitting quietly amongst them looking me right in the eye. His red cloud coat was very distinctive too. I reached into the pen and lifted him out but really – he chose us! From that moment our little red kelpie became known as Bluey. He settled in quickly from the first night and he didn’t complain, scratch or whine. His first two years were spent play fighting with our other dog Jessie, an eight year old German Sheppard who adored Bluey and had a new lease on life with the puppy to deal with. As I worked from home we spent a lot of time together and he became very attached to me and slept in my office most of the time. He loved his walks and as a younger dog would run and run checking out every tree in sight. He was not a ball or a stick chaser – so not much fun there! He did his fair share of destruction as a young dog, got under the car and chewed off the mud flaps and damaged the plastic bumper bars too and twice I had to re wire the trailer as he chewed all the electrical wiring! He has always had a fascination for little white fluffy dogs, puppies and especially Dachshunds with a need to try and round them up, the natural herding instincts of the Kelpie coming to the surface. 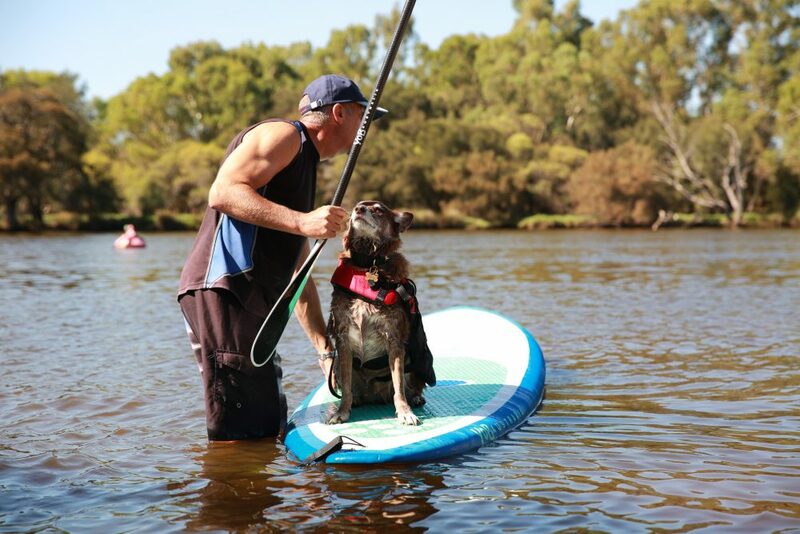 Bluey became a SUP dog about three years ago. He was much more agile then and would walk around on the board and fall in a lot more often. These days he is so much more relaxed, just chills and enjoys the ride and dangles his toes in the water. He just seems to know when we’re heading to pups on sups on Saturday morning and sticks his beak into everything that is happening – therefore has been dubbed the “Supervisor”! He is good at it because of his calm relaxed nature when on the board and his love of the water. But his main reason to be on the board is because I am on it and he wont be left behind on the beach. His age is showing now and his agility is declining but he still loves to get out and the water and swimming is so good for him. Bluey has always been a beautiful soul, a bit of a sook, is getting grumpy in his old age, but the best little mate a guy could have!